An unsettling thought occurred to me when I saw a kid’s shoe fly off – up, up, up, UP – and just stay there. Sure, I weigh more than a girl’s tennis shoe. (Don’t judge.) But who’s to say that tennie couldn’t be me in the indoor recreational windstorm that is iFly? Other, more basic, questions crossed my mind, too. Why did I have to take off my wedding ring, my medical ID bracelet, even the cute bobby pin in my hair before my flight? What was the real purpose of the jumpsuit? The goggles? And a helmet? Exactly what was my head not supposed to hit? “We just want to be safe,” the iFly instructor says. There are plenty of thrills out there for people who don’t get enough of an adrenaline rush from a morning spin class. Or is it endorphins? I can never remember. Indeed, just Google any of the following to quicken your pulse: volcano boarding, crocodile bungee, train surfing and, my favorite, slack lining – which is like walking a tightrope, sometimes over a canyon, except the nylon rope isn’t tight. It bounces? Yay! Sign me up! But apparently people like conquering fear. How else do you explain the wild success of a company called iFly, an adventure business that simulates skydiving. The first center opened in Seattle in 2011. Since then, iFly has opened 34 new facilities here and abroad. Lucky us. There’s now one in Davie, just off Interstate 595. But beware. Racing heart aside, the actual iFly experience is fairly simple. You gear up, stand in the doorway of a giant round room – air whooshing before you – then summon the courage to fall forward. The instructor is there, waiting. He goes with you – and he does not let go. Experience the feeling of free fall as you float on a smooth cushion of air. There’s no parachute, no jumping, and nothing attaching you to planet Earth. It’s just you FLYING in the air. Super fun, super safe and super cool! For me, it felt like trying to balance on top of a coconut palm during a hurricane. (Not that I’d tried that yet, either). Jessika Kattah, 30, of Sunrise, and Reinaldo Maiz, 28, of Cooper City, are pros at this. And Kattah and Maiz are both paraplegic. He’s been in a chair for eight years, after he was hit by a car on his motorcycle and left for dead. It’s been about four years for her, after spinal surgery went terribly wrong. “We’re into all kinds of extreme sports,” he says. Kattah and Maiz were at iFly this night taking advantage of what the company calls “All Abilities Night.” You don’t need body strength, really, in the tube, so the iFly experience is open to those living with things like paralysis and cerebral palsy. The instructors are there to help everybody out of their chairs or off their walkers, and lift them up into the air. 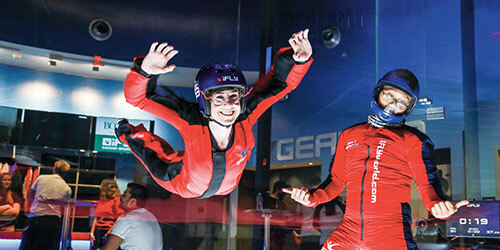 The science behind iFly is actually rather simple – now that they’ve figured it out. And because physics is physics, the iFly facilities all look similar: There are two towers with a concrete connector channel at the top, and then the 56-foot-high air cylinder down the middle. The center flying tunnel is about 16 feet in diameter. And while it feels as though the fans are blowing up from the bottom, there are actually four, 350 horsepower fans at the top, in the connector channel. Those fans blow the air down the towers, where it’s routed through an underground chamber and back up into the central flying tower. In Davie, they had to dig down 35 feet to accommodate the air turn-around chamber, Braun says. Just remember. Super heroes don’t wear tennies. For information, call 954-280-4359 or visit iflyworld.com. The address for this location is 11690 W. State Road 84, Davie. Prices start at around $70 for a two-flight session, which typically last about 10 minutes each.